Room Details: All rooms are equipped with direct dial telephone, shower & toilet, TV, air conditioning, minibar, hair-dryer. Rooms are heated by central heating. General facilities: This hotel also has air conditioning and central heating in public areas, garden, TV lounge, Turkish Bath, outdoor parking area, power generator. Wining & Dining: There are 2 restaurants with 150 pax indoor capacity. The breakfast lounge can serve up to 70 pax. The lobby bar, terrace bar will be serving for your leisure time. 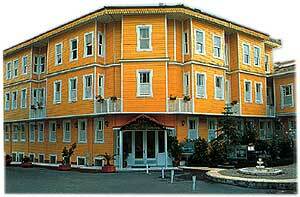 Location: The distance from Atatürk airport is 18 km..
*Buffet breakfast, VAT and service charges include to room rates.